Originally published in Signal Integrity Journal on January 22, 2019. My aging vibration system started faulting. Shaking for 30 years takes a toll on a thing, after all. The system is pretty straightforward, just a big stack of audio amps and a controller. But I had been ignoring the warning signs and I recently have gotten my overdue comeuppance and the system finally tuckered out, it seemed for good. This is a bit of a sad sack story….but with a happy ending. My bit-slicing days were few and far between (and far, long and away); I have always had a better sense of RF circuits and pipes and bursty lines on phosphor (or, now OLED), but my bliss in my quiet little anechoic chamber was about to be busted. My cell phone vibrated. Elmer was calling. My inner groan escaped over my gritted teeth. “What? It’s only older than my grown-up, graduated and working kids!” We bought the beast used and it lasted for 10 years. “Well, it’s not starting and the amps are dying.” The original rig was composed of 20 4kVA Class D amplifiers, all ganged together and coupled into the electrodynamic shaker, which is really just a big speaker. The system is modest, by industry means, but it served us relatively painlessly for a decade. After casting about for a few weeks, sending pleading messages around the industry, dispatching the dead boxes to various coasts, we got nowhere. 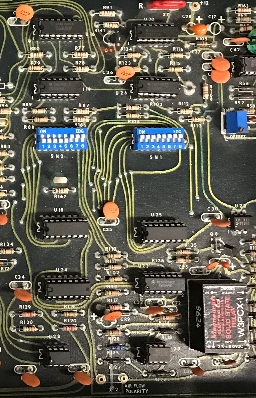 The last guy who touched the design probably retired in the 90s and the design was definitely pre-CAD, pre-FPGA and, well, in modern electronics terms, pre-historic. But, although this story does not really end well, we decided, as engineers, we could try to fix the thing, or at least give it the old college try. The one thing that these vintage pieces came with—and I do not know how much the “art of the technical manual” still exists—is a wonderful, almost, lovingly written manual, still coupled to its cracked three-ring binder. The prose explained the theory of operation—almost tinged with a bit of remarkableness about the beauty of switched-mode circuits. The core of the function of the thing was to create a 78 kHz pulse-width (PW) modulated signal that drove both the DC-DC conversion frequency for the amps and the PWM heartbeat, modulated by the drive signal from our vibe controller. This was piped out through some serious low pass filtering, which was used to trim out the harmonics. The whole thing is about efficiency. The Class D operation means that the power transistors (another story there) are either fully “ON” or “OFF.” In the ON state, they conduct with very little output resistance, hence the low loss (as opposed to a Class A amp which is always biased a bit and spends its time in the linear region where the losses are high). Readers of Signal Integrity Journal might be bemused by the curvaceous layout of the PCB. At these frequencies, one need not worry about matching, characteristic impedance, skew, timing, or reflections. From a quick look at the board in the figure, it is apparent that the propagation of the signals is as lazy as a Sunday stroll at the market. 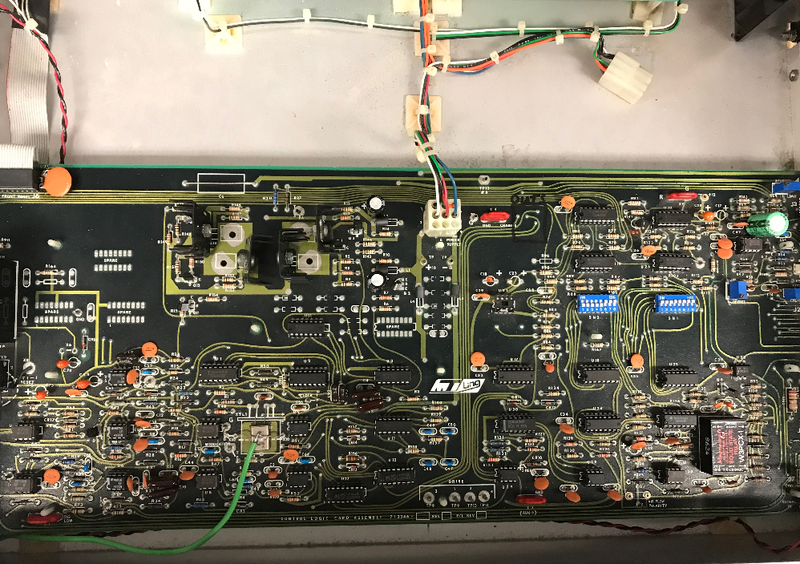 The “logic” of the circuit was a mix of op-amps, AND, NAND, NOR, and other gates, stitched together such that any error in the critical parameters returning from sensors in the table buzzed a whiny alarm and the system would not run. No EPROMs or microprocessors here, just a cascade of 1s and 0s driving the table. For this analog guy, who has not looked at a logic truth table, well, maybe since this thing was put together, it was a sometimes fun/sometimes aggravating process of doling out digits in the circuit and figuring out how the logic worked. Anyway, needless to say the designers of this beauty took great pride in the layout. One can almost imagine the scrape of an Exacto knife, trimming the mask, and, as you can observe, lots of test points! No fancy-schmancy error codes or indicators, just a set of DIP switches to isolate the errors. One of the challenges of this project was re-populating the CMOS DIPs (the lucky thing is that everything is socketed). Replacement parts are dwindling and finding the right parts is the Internet equivalent of hunting around in your nutty uncle’s dusty attic. But! Parts can be found and swapped out. If there was any “fun” in this exercise it was puzzling out the circuit and bringing the logic back to life with a fresh 4043 Quad State R/S latch. Anyway, in the end, the dinosaur was finally deemed extinct and a shiny new beat was put on-order. But in retrospect, the experience refreshed my understanding of the logic, and importance, of the lowly XOR gate.